Portugal in World War II: How to Assess its Neutral Status? For Oliveira Salazar’s (1889–1970) corporatist dictatorship, the Estado Novo, Portugal’s neutrality throughout the Second World War became one of its key legitimising elements until its demise in 1974. The regime did not hesitate to invoke the services rendered to the allied cause in order to claim its place in the Anglo-American sphere of influence at the outset of the Cold War. This allowed the Estado Novo, a true relic of the fascist period, to become a founding member of NATO, a key political-military alliance of the so-called “Free World”. In his talk, Pedro Aires Oliveira will present some of the key aspects of Portuguese policies during the Second World War, as well as discuss a number of issues (e.g., Portugal’s proximity towards the Axis, the regime’s attitudes vis-à-vis the Jewish refugees) which have allowed a ‘revisionist’ historiography to problematize the country’s neutral status between 1939–45. 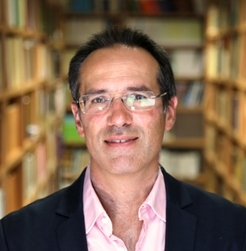 Pedro Aires Oliveira is a Professor of History at New University of Lisbon. His field of research is history of international relations, colonialism and decolonization and contemporary History of Portugal. He is the author of The Spoils of the Covenant. Great Britain and the Portuguese Colonial Question 1945–75 (Ink-of-China, 2007) and History of Expansion and the Portuguese Empire (co-authored by J. P. Costa and José Damião Rodrigues; Sphere of Books, 2014) and Farewell to the Empire. 40 years of Portuguese Decolonization (co-edited with F. Rosas and M. Machaqueiro; Nova Vega, 2015). He has articles published in several national and international magazines, such as International Relations, Portuguese Studies, Cold War History and International History Review .